wonderful tasting, easy and fast to make, and taste fabulous! True Italian Pasta Fagioli does not have ground meat. Not sure why Olive Garden puts ground beef in there's. Pasta Fagioli was considered 'peasant' food.....those who could not afford meat would prepare this hearty dish for the family. Then it became a dish many Italian Catholics would prepare on Fridays for dinner during Lent (when meat was not allowed). My opinion, ditch the ground meat in the recipe, and you will make it even healthier than before. True Italian Pasta Fagioli does not have ground meat. Not sure why Olive Garden puts ground beef in there's. Pasta Fagioli was considered 'peasant' food.....those who could not afford meat would prepare this hearty dish for the family. Then it became a dish many Italian Catholics would prepare on Fridays for dinner during Lent (when meat was not allowed). My opinion, ditch the ground meat in the recipe, and you will make it even healthier than before. This looks hearty. I like recipes that are low in calories too. Thanks Shalina...I hope you get a chance to make it! Oops...So sorry Mary. It's 1/2 cup of water. 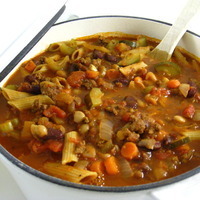 Here's the link to my original recipe-http://www.skinnykitchen.com/recipes/make-olive-gardens-delicious-pasta-fagioli-at-home/ Hope you enjoy it! Just added the water to the recipe! The amount of water was never listed. How much do I add? My recipe is lower in calories and fat due to draining the beef before adding to the soup. Just by doing this simple step, you cut down on the fat and calories.